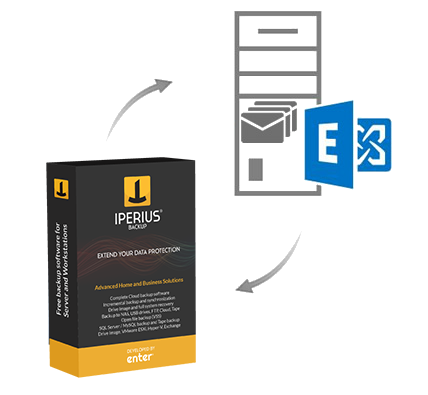 Iperius Backup is one of the best software on the market to make Exchange Server backup. Protecting your mail server will no longer be either a technical or a cost problem. Using Iperius you can make hot and incremental backups of Exchange without any interruption, creating an image backup or exporting individual mailboxes to PST files. Iperius can connect to any Exchange mail server in a few seconds, the same way whether installed on the server or on any other workstation in the network. You can select mailbox accounts to be exported, specify the destination, and everything will work automatically. Iperius can make safety copies of Exchange Server in different ways, e.g. exporting individual mailboxes to PST files (the standard Microsoft format for mail databases, to keep the maximum compatibility), or making an image backup of the mail server, in a block-level and incremental mode. Exchange database files (.edb) and log files are saved as part of this backup. The compatibility with standard Microsoft formats is perfectly kept also in this backup type (VHD/VHDX). Iperius is an extremely versatile software, that allows you to save the mailbox accounts to any destination: network shared folders, LTO tape drives, FTP servers, cloud storage services like Google Drive, OneDrive, Amazon S3, Microsoft Azure Storage and Dropbox. All backup procedures can be made with an integrated compression and AES 256 bit encryption, for the maximum security. Thanks to the image backup mode, Iperius allows to automatically truncate Exchange logs, and get a better server efficiency and faster backup procedures. Moreover, Iperius allows to restore individual mailboxes, importing any PST file to any Exchange account, also from a different machine in the network. Iperius is software designed for maximum performance with minimal resource consumption. System administrators know how a mail server needs a lot of resources and a great stability. Iperius is the lighter and more efficient solution to make Exchange mail server backup without any interruption.